We face many challenges in higher ed, but one that I know many schools struggle with is keeping track of student’s activities, involvement, and participation in things like study abroad trips, student organizations and more. Record keeping can be spotty and if you’re at a larger institution, not shared often or at all. I’m always interested to see new tools come along, and this one caught my eye as its a startup launched by current college students at the University of Minnesota. 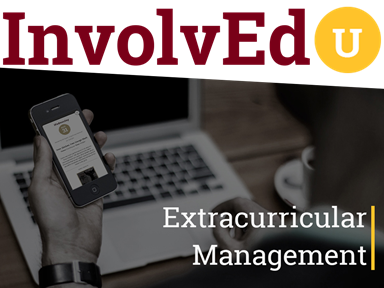 It’s called InvolvEdu and it’s a way for students and institutions to populate and verify activities, honors, awards and more. After coming up with the idea, the duo of Nick Alm and Joe Janiszewski have launched a Kickstarter campaign to help fund the building and completion of the site. I asked a few questions via email to the founders about InvolvEdu, why they started it and their goals for the app. Joe: The idea was really born out necessity. As the founder of a student group, and by being involved in many others, it became clear that there were real inefficiencies in the way that students discovered and ultimately participated in extracurricular events on campus. I sought out the build the platform that I wanted to use myself. Nick: Some of the original inspiration for InvolvEdu came from this article at Forbes. The article talks about how 43% of grades given out today are A’s and points out that it is more important in the long run to focus on self development by getting involved than it is to have perfect grades. This article addresses some of the arguments for GPA importance but illustrates how even schools like Harvard give out A’s more than any other grade which is causing professional recruiters from large and small companies to consider other factors and evaluate different criteria when trying to hire a student. Mike: What support have you received and continue to receive from the University? Joe: We’ve worked very closely with student groups and school administrators throughout our design and development. Everyone that we’ve worked with, from the U’s Student Body President to members of the Greek community, has been extremely supportive, and has given us a lot of positive feedback. This has been really great for us and has actually led to one of our biggest competitive advantages in that we’re building a platform is designed 100% student first. We’re not focusing on building features in order to collect subscription fees from school admins, we’re focused on building the features that students themselves will actually use. In 2014, the University of Minnesota’s annual “Biz Pitch” gave InvolvEdu the “Most Socially Beneficial Business Concept” Award and InvolvEdu was also a semi-finalist in the General Division of the 2014 Minnesota Cup. Mike: How do you plan to verify activities that students complete? Joe: We have two-step verification. The first step is the student’s RSVP to attend an event or meeting. The second step is up to the actual event organizer (student group officers) to mark the students attendance. We’re building multiple ways to make this happen (whether it is an event code that students enter into the app, or a toggle next to each student who RSVP’d) as the easiest way for each group will vary depending on the size of the group and frequency of their meetings. So, as students participate in events, they start to build out their involvement transcripts where all of their participation is verified. Mike: Why Kickstarter? Have you sought out other funding such as incubators, angels, etc? Joe: We chose Kickstarter because we want to build real relationships with our backers. By pooling all of our backers and early adopters together and having them be the first to beta test our products, we’ll be getting the highest quality feedback which will aid in the design and development of our future releases. Angels/Incubators are definitely on our radar as well, but only after we’ll be able to foster a significant user base and build relationships with our Kickstarter backers. Nick: Overall, the mission of InvolvEdu is to give students from any background the opportunity to distinguish themselves in a way that they historically have been unable to do. We hope to help people shift their mind set and value the self-development and learning that can happen when you lead a student club or get involved with a volunteer organization. We built InvolvEdu to be just as valuable to students as it is to administrators and recruiters. It all starts with shifting mindsets and then creating legitimacy in the extra-curricular market. InvolvEdu will do just that.